Thanks for the update Samuel. I couldn’t agree more with your comments – I’m still in shock after reading the Canberra Times story on Saturday. I have listened to Mike Jeffreys even since he joined 2CC (on the Drive Show). Canberra Radio has lost a great presenter and it makes me quite mad to think he was sacked after all he has done for 2CC. Like you, I’m left to ponder ‘what now?’ – I guess I will still listen to 2CC but it certainly won’t be the same without Mike. Mike (if you happen to be reading this) – all the best for the future and I hope to hear you on the air again soon. Thanks for many years of fine broadcasting. No worries Darren, it’s nice to hear from you again despite the circumstances. I’m not sure that it [Mike’s departure] has actually sunk in for me yet. It probably will when Mike isn’t on the radio on Tuesday. Still, the memories will last. 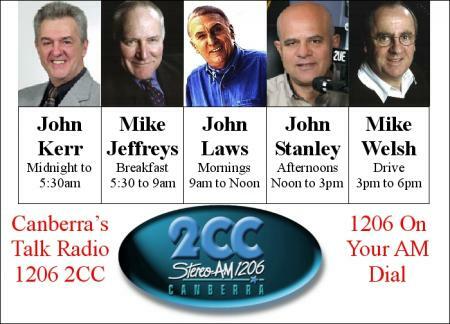 I’ve already given up on weekend mornings and Tim Webster’s endless parade of “experts” (I liked Tim’s show when it started…it’s devolved since then, especially this year)…although admittedly when it comes to talk radio in Canberra, I still think 2CC is a mile ahead of the rest. Incidentally, I missed the Canberra Times on Saturday…do you have a copy of the article Darren? I’ll send you an email about this. Pity that Mike’s gone but Samuel do you want to host the show? Haha, sure Jamie, of course (although I’d probably say that about any talk shift)…but after my near-thousand word rant above, do you think I have a snowball’s chance in hell of even being considered for the job? I’d rate the odds of it happening somewhere in the realm of winning the lottery without a ticket. I used to listen to Mike Jeffreys when I lived in Sydney in the 80’s. From memory he was on 2gb and the ABC. It was a pleasant surprise when I moved to Canberra in the late 90’s and encountered his dulcet tones on the radio again. Canberra radio will be a shadow of its former self for not having Jeffreys on air. What I will really miss is the discussion of local issues. Mike had an ability to cut to the chase. He wouldn’t readily accept the spin that local political and commercial figures trotted out to other media organisations -usually unchallenged. I think it’s back to listening to Newsradio on the way to work. I’m losing count of the number of people who told me that they are flicking to the ABC or music stations now that Jeffreys is gone. I have the radio turned off at the moment…I’m considering tuning in to Chris Smith on 2GB until I have to go out in an hour or so, at which time I’ll get out the iPod and listen to this morning’s Rush Limbaugh show. I can’t bring myself to listen to local radio in the morning at the moment. Just can’t do it. It is sad that Canberra no longer has a pompous conservative wannabe-Machiavelli on radio (and I actually mean this sincerely). The more diversity we have, the better. I agree that Parton will water the show down a bit and occasionally attempt a rant. But I will certainly give him a listen. If 2CC expect better ratings now that they’ve boned the only decent talkback guy in town (and YES, I definitely include 666 2CN here) they’ve gotta be kidding! I filled in for Jefferys a few times a year or two back and found that their audience is sooo small that it’s incredibly difficult to elicit interesting, intelligent or amusing calls. If it’s ratings 2CC want, it’s simple: wait until digital radio comes to town and implement a decent Easy Listening format. No one is doing it, it’s inexpensive to run and the most docile announcers in the world will sound at home on it. Mark P. would fit in there just fine! Davky, I understand where you are coming from as I can understand how (albeit respectfully disagree) people can see Jeffreys as pompous or speaking too slowly. I’m with you on the diversity bit. I, for example, can’t stand the two blokes who host breakfast on FM 104.7, but they appeal to a certain market and choice is a good thing…I respect their right to broadcast and I welcome their presence on the radio. puppydoug, if you’re who I think you are, I remember you filling in on 2CC (I was going to give you a plug on here at the time with a photo of you from Wayne Mac’s book) and I think you are one of the better talk hosts I’ve heard in recent times. You’re not the first ex-2CC presenter this week to suggest that they implement an easy listening format. If my predictions for their ratings are accurate, I wonder if this is exactly what they will do. If so, I think they’d be better off with the typical “part talk part music” format of many regional commercial stations. 2CC will be able to have their current format plus an easy listening music format plus another talk station where they can provide 2UE’s programs (including George and Paul) during the football telecasts. When digital radio comes in each station will be given two supplementary licences so 2CC will be able to cater for everybody. Good on you for exposing this as as I do not read canberra times, I thought Mike was on holidays and was bemoaning his abcence this morning hoping Mike would be back monday. I am really astounded that some manager could think Mark Parton can fill Mike,s position in this slot. The calibre of announcer on 2CC is really falling, with Tim Webster proving to only be a news reader and not measuring up with any kind of editorial comment, just sensationalist rubbish and blan fence sitting. But as one person has said already, Mark sounds like a really nice guy as does tim too bad its talk back. Maybe they can create a new show called Mark and Tim in the morning and they can replay bits of interviews they have already done two days ago with someone really controvercial like say may be a blank refrigerater door or some paint that was dryng, just to fill in time. Then they could have chef come on with some really good recepie,s for watercress sandwiches and celery juice. I think 2cc have found them selves halfway through the V8 supercar season with a garage full of toyota prius’, good luck with that.Internet streaming of 2gb loks good from here! All the best to Mike where ever you end up.